When constructing an aero wheel, the key is to design a wheel that moves as little air as necessary. In contrast would be the design of a turbine fan, shaped to move as much air as possible. Air friction is proportional to the square of the speed between an object and the air, for example double speed relates to four times the friction and four times the energy consumption. Think of a rolling wheel on a car, the tire touching the ground has zero speed through the air. The center of the wheel has the same speed as the body of the car. This means the very top of the wheel has double the speed of the car. Thus the critical part of the aero wheel is the surface where the wheel is interfering with the air curtain coming from the front of the vehicle. Keeping this as flat and as closed as possible is vital. The second critical factor is the resistance created by the rotation of the wheel. Rotating a fan requires more energy than rotating a disc. With this in mind, we kept the inside of the wheel flat and smooth and the ventilation holes shaped to not move air. The forged technique also gives us the opportunity to make the left and right wheel directional with the car, creating no side force and achieving a sleek symmetric flow field behind the car. Last but not least the wheels weight affects the efficiency, especially in acceleration and braking. 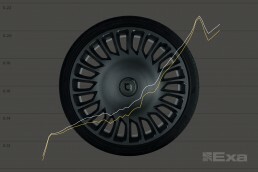 A forged wheel typically weighs 25-30% less than the same design casted. Plus it allows much more accentuated corners and lines thus achieving greater character. 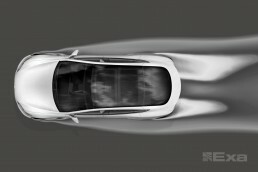 When developing the Model S, Tesla turned to EXA for Computational Fluid Dynamics (think “virtual wind tunnel”). We 3D scanned the Model S equipped with the OEM Turbine wheel and supplied this to EXA to use as a benchmark. 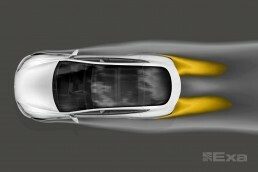 EXAs simulation results indicates that our wheel, the Razor™, reduces the drag for the whole car by 9,9%. 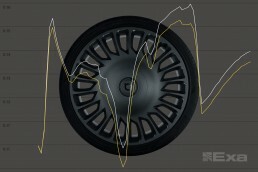 This result is achieved by having aerodynamics in mind during the whole design process of the wheel. In comparison with 21" OEM wheel. Simulation by EXA.